Elsie is a city girl. She loves the noise of the cobbled streets of Boston. But when her mother dies and her father moves them to the faraway prairies of Nebraska, Elsie hears only the silence, and she feels alone in the wide sea of grass. Her only comfort is her canary, Timmy Tune. But when Timmy flies out the window, Elsie is forced to run after him, into the tall grass of the prairie, where she's finally able to hear the voice of the prairie-beautiful and noisy- and she begins to feel at home. 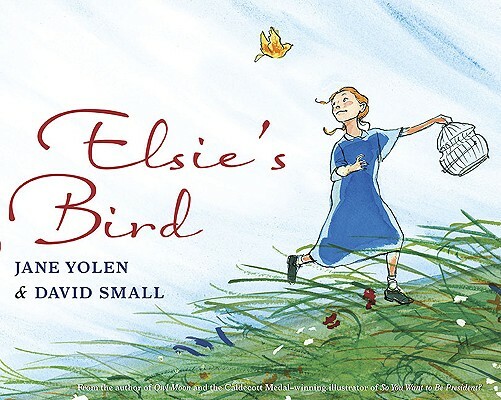 Jane Yolen and David Small create a remarkable, poetic, vividly rendered book about finding one's place in the world. Born and raised in New York City, Jane Yolen now lives in Hatfield, Massachusetts. She attended Smith College and received her master's degree in education from the University of Massachusetts. The distinguished author of more than 170 books, Jane Yolen is a person of many talents. When she is not writing, Yolen composes songs, is a professional storyteller on the stage, and is the busy wife of a university professor, the mother of three grown children, and a grandmother. Active in several organizations, Yolen has been on the Board of Directors of the Society of Children's Book Writers and Illustrators, was president of the Science Fiction Writers of America from 1986 to 1988, is on the editorial board of several magazines, and was a founding member of the Western New England Storytellers Guild, the Western Massachusetts Illustrators Guild, and the Bay State Writers Guild. For twenty years, she ran a monthly writer's workshop for new children's book authors. In 1980, when Yolen was awarded an honorary Doctor of Law degree by Our Lady of the Elms College in Chicopee, Massachusetts, the citation recognized that "throughout her writing career she has remained true to her primary source of inspiration--folk culture." Folklore is the "perfect second skin," writes Yolen. "From under its hide, we can see all the shimmering, shadowy uncertainties of the world." Folklore, she believes, is the universal human language, a language that children instinctively feel in their hearts. All of Yolen's stories and poems are somehow rooted in her sense of family and self. The Emperor and the Kite, which was a Caldecott Honor Book in 1983 for its intricate papercut illustrations by Ed Young, was based on Yolen's relationship with her late father, who was an international kite-flying champion. Owl Moon, winner of the 1988 Caldecott Medal for John Schoenherr's exquisite watercolors, was inspired by her husband's interest in birding. Yolen's graceful rhythms and outrageous rhymes have been gathered in numerous collections. She has earned many awards over the years: the Regina Medal, the Kerlan Award, the World Fantasy Award, the Society of Children's Book Writers Award, the Mythopoetic Society's Aslan Award, the Christopher Medal, the Boy's Club Jr. Book Award, the Garden State Children's Book Award, the Daedalus Award, a number of Parents' Choice Magazine Awards, and many more. Her books and stories have been translated into Japanese, French, Spanish, Chinese, German, Swedish, Norwegian, Danish, Afrikaans, !Xhosa, Portuguese, and Braille. With a versatility that has led her to be called "America's Hans Christian Andersen," Yolen, the child of two writers, is a gifted and natural storyteller. Perhaps the best explanation for her outstanding accomplishments comes from Jane Yolen herself: "I don't care whether the story is real or fantastical. I tell the story that needs to be told." copyright ? 2000 by Penguin Putnam Books for Young Readers. All rights reserved. David Small grew up in Detroit, studied Art and English at Wayne State University and completed his graduate studies in art at Yale. He went on to teach drawing and printmaking at the college level for fourteen years, during which time his first book Eulalie and The Hopping Head was published. David no longer teaches but has continued illustrating. David has illustrated twenty-seven picture books, and has also provided the text for six of them. His Imogene’s Antlers has been featured for fifteen years on PBS’ “Reading Rainbow.” Fenwick's Suit presently is in production by Fox 2000. Four of David’s bestselling picture books were written by his wife, Sarah Stewart. Their book The Gardener was the recipient of 17 awards including the Christopher Medal and the 1998 Caldecott Honor Award. David’s books have been translated into six languages. He also has worked years as a freelance editorial artist, with his drawings appearing regularly in The New Yorker, The New York Times, The Wall Street Journal, The Boston Globe and The Washington Post. His reviews of picture books appear frequently in The New York Times Book Review. David Small and Sarah Stewart make their home in Michigan in an 1833 Greek Revival house on ten acres of land along the banks of the St. Joseph River. Their house is on the National Register of Historic Places, and their property marks the northern boundary of the Great Tallgrass Prairie.